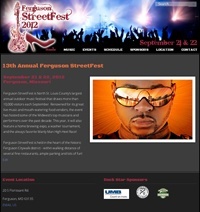 The Ferguson StreetFest is North St. Louis County’s largest annual outdoor music festival that draws more than 10,000 visitors each September. Besides bringing in amazing music acts during the two day festival, providing lots of delicious food and fun carnival games, StreetFest is known for their signature event… the Manly Man High Heel Keg Race. We gave this website a lot of rock n’ roll “attitude” with black background, a dark and red color scheme and custom rocker font. A photo slideshow on the front page shows highlights from previous years.